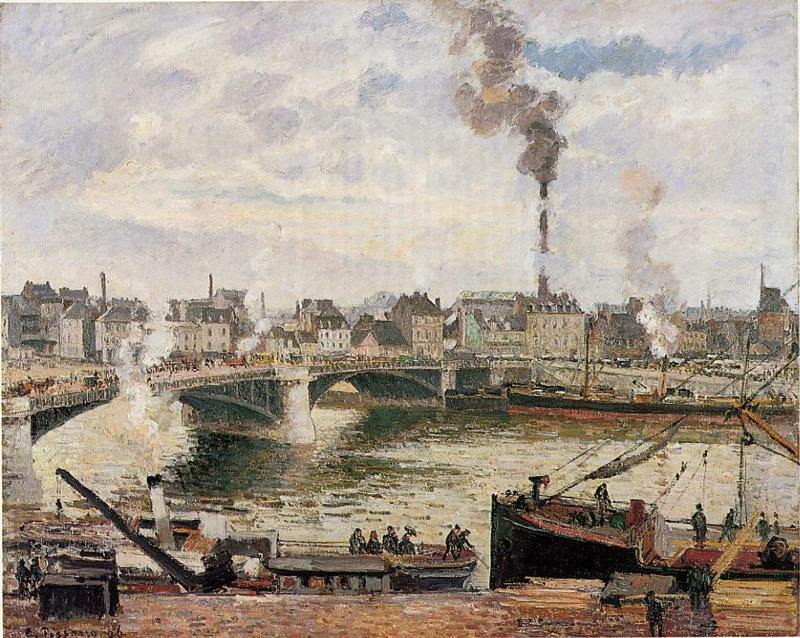 In 1883 Pissarro had painted a series of pictures of Rouen, which marked a move away from the preceding large figure works. This painting is one of a more substantial series of the city that he executed during three campaigns in 1896 and 1898. He exhibited the results of the first campaign (January to April 1896) at Durand-Ruel's soon after his return to Paris, and their success was such that the dealer paid for another trip from September to November of that year, the two trips resulting in 28 pictures. The third campaign, from July to October 1898, led to another 19 works. This picture was probably painted during the second visit. Pissarro's decision to work at Rouen again was doubtless largely prompted by the success of Monet's paintings of the cathedral, but also by the fact that the city offered that mixture of old and new that so interested him. The series consists both of views of the medieval centre and of the bustling, modern docks, each showing differing effects of light and atmosphere. During the second of his visits Pissarro exclaimed that Rouen "is as beautiful as Venice...it has an extraordinary character". Like that of 1883, this series also marked a change in Pissarro's style. After his flirtation with the techniques of neo-Impressionism in the late 1880s, he here returned to the transparent colors and light brushstrokes of Impressionism. The bridge that dominates this image is the one that appears most frequently in the series and was built in 1885 to replace an earlier suspension bridge. While some of the dock scenes are transformed by the warm glow of full sunlight or of sunset, this one is executed in the grey, subdued colors of an overcast day. The harshness of the scene is compounded by the smoking funnels and chimney. The chimney that rises high above the surrounding buildings, billowing thick black smoke, was part of a gasworks, and to its left can be seen the glass roof of the newly built Gare d'Orleans. This depiction of modernity and industry is animated by the workers in the foreground and the numerous figures dotted along the bridge. Despite its apparently unsightly features, in such works Pissarro saw himself as seeking out beauty in those places overlooked by others, as he once wrote to his son Lucien: "One can make such beautiful things with so little".